In 2012 Pavie is a collector’s item! In 2012 Pavie celebrated its reclassification, upgraded to Grand Cru Classe A St. Emilion. To commemorate it they have produced a special bottle. The design is stunning, the entire bottle if black, with a gold print. In 2012 Pavie was awarded and excellent 95 points from Robert Parker, saying ‘This complex, authoritative, full-throttle Pavie possesses much more accessibility and precociousness than most vintages…The tannins may be the sweetest of any young Pavie I have tasted … and last for three decades.’ In 2012 Angelus also created a similar bottle, who were also promoted to Grand Cur Classe A. Angelus 2012 was also awarded 95 points, yet trades today at £3,000 per case of six bottle 2012. As such, Pavie 2012 trades at a 24% discount to its neighbour and is extremely appealing at £1,150 per case of six bottles. Since their promotion the average price of Chateau Pavie has risen 30% and Angelus 28%. The only other First Growth to ever create such a label was Mouton Rothschild, who accidently were the last major Chateau to be promoted to Premier Cru in 1973. In 2000 Mouton Rothschild decided to break with its tradition to create a special design, which the 2012 Pavie design strongly resembles. The 96+ point scoring Mouton Rothschild 2000 today 64% premium to Mouton Rothschild’s average case price, having reached £11,000 a case of 12. The reason for the premium, the prestigious bottle. Pavie only produce 5,500 cases a year, much lower than the left bank First Growths, Mouton Rothschild produce 20,000. As such Pavie 2012 is a wine to collect! In 2012 Pavie also produced a very small quantity of special edition magnums, which are only being released through exclusive channels. I am delighted to be able to offer magnums for £550. These are extremely rare and are presented in a stunning gift box. 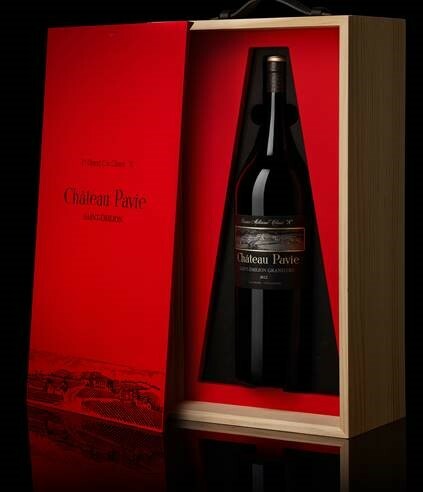 The Special Edition Magnum Presentation Box is a true collector’s item and would take pride of place in any cellar. In ten years’ time, Pavie 2012 Magnums will be rarer then hens teeth and command a high price indeed. The 2012 Pavie celebrates its reclassification and upgrade to Class A St.-Emilion by sporting a new black label with gold print. Fortunately, every Pavie has benefitted since Perse began a complete makeover of this estate in 1998. From 47-year-old vines, the 2012 has an inky purple color, judicious toasty oak in the nose interwoven with copious blackberry and blackcurrant fruit, Christmas spices, as well as licorice and graphite. Full-bodied, rich and moderately tannic, it will require 5-7 years of bottle age but should drink well for 20-30 years. Kudos to Chantal and Gerard Perse for their extraordinary commitment to quality, which is so evident in this more challenging vintage than some of the great years like 2009 and 2010. Very low yields of 28 hectoliters per hectare were obtained from this 92-acre estate.